Nash Community College’s Broadcast Production Technology degree program has integrated new equipment into its curriculum thanks to a generous donation from Capitol Broadcasting Company. Valued at more than $100,000, the gift includes modern TV production and post-production equipment. The degree program began last fall preparing students for careers as announcers, music directors, news staff, promotions and sales representatives, station managers, broadcast editors, camera operators, field audio engineers, associate producers, control engineers, production managers, floor directors, multimedia producers, effects operations and other broadcast technician duties. “We currently have 12 students enrolled, with others interested in beginning in the fall semester. Interest has increased as students have discovered the program, and seen the real-world production experience they can gain right here on the community college campus,” Small said. Students learn broadcasting fundamentals in NCC’s main on-campus production studio, Studio 67, and in a new audio production studio, Studio B, where they practice voice-over work and radio operating skills before going live on NCC’s Big Bang Radio WNIA 89.1 FM. NCC Broadcast students gain experience in contemporary studio operations, script and broadcast writing, performance in media, broadcast and media history, live broadcast, methodology, sales, and ethics. They create and edit audio and video productions using the latest software with modern studio audio and video equipment. Individuals interested in the Broadcast Production Technology program may call 252-451-8220 or visit www.nashcc.edu/bpt. 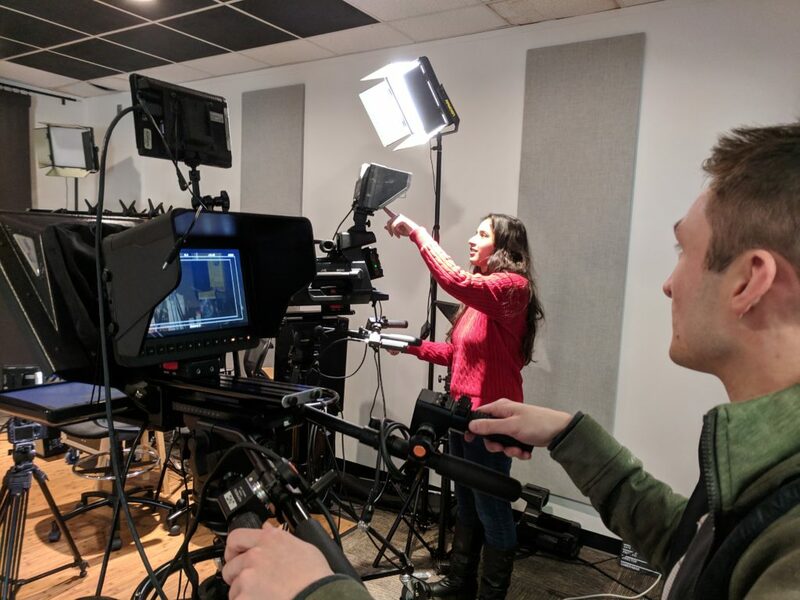 Pictured above: NCC Broadcast Production Technology student Nouran Shaaban (left) and Studio 67 Associate Producer Isaac Anderson work with TV production cameras and pedestals donated by Capitol Broadcasting Company.